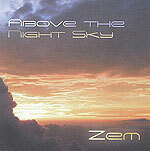 CD review: "Above the Night Sky"
North County's singularly named Zem is a keyboardist and composer whose latest release (apparently his third) is a dramatic bit of New Age music that draws equally on folk and cinematic themes. Similar in construction to the music of Jean Michel Jarre or Vangelis (only with a greater use of vocal backing chorus), he uses his synthesizers to create a full band sound  everything from an oboe to an acoustic guitar. For a local guy who doesn't seem to tour much and doesn't get much in the way of live audience feedback  who seems to issue all his music from his own home-based digital recording studio  Zem has written a remarkably consistent set of nine songs. His ability to craft themes that suggest soaring ambition, infinite longing, or intimate ache is as impressive as the slowly building arrangements with which he's framed those themes. As mentioned, many of the tracks here have a cinematic quality to them  a modern, symphonic approach. But on the title track, he uses a backing vocal chorus to create a high church kind of feel. It's not church music, but it does create the atmosphere of a large, open cathedral with Zem's quiet yet powerful piano lead framed by the voices. The CD shows a musician with both vision and the skill to realize that vision  his music is contemplative yet inspiring, grand without being grandiose. He's onto something, and it should be fun watching him continue to explore and grow.